This was Brad's second year and Doug's first of accompanying Keith to work for Take Our Kids to Work Day. 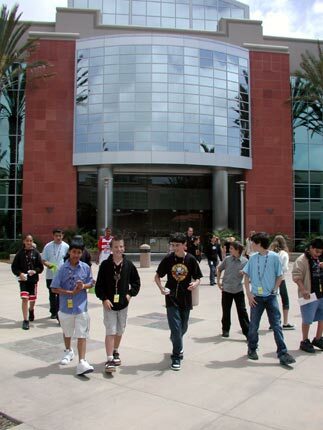 Intuit has a tradition of putting together a really excellent program for kids in the morning before "job shadowing" parents in the afternoon. 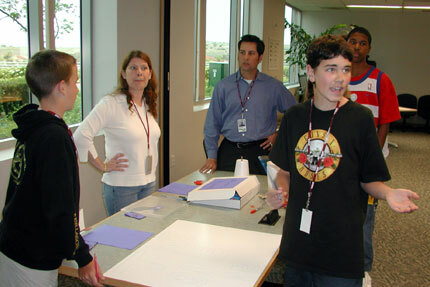 Intuit runs two groups: 8 to 11 year olds, and 12 to 15 year olds. Brad and Doug split neatly into separate groups, which of course was better for all involved. Programs are different for each group in an effort to keep their attention. 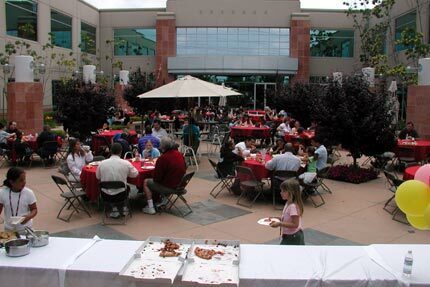 For instance, Doug started at the cafeteria while Brad when to the Data Center to see the hundreds of computers that power Intuit internally and externally on the Internet. Doug hooked up with his friend Sam Neher, son of Keith's co-worker Ted and Kristi's sometime tennis partner Darlene. The Neher's have been kind enough to have us over to dinner a couple times while the remodel has been in process. 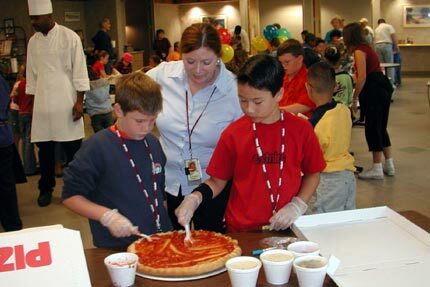 The first stop for the younger kids was the Intuit cafeteria, where the kids broke into teams of 2 and 3 and made pizza. Here the cafeteria manager, who is running this "station," checks on Doug and Sam's progress. I thought it was great that the kids saw some non-technical jobs at Intuit. The kids just thought it was great to make pizza. After the pizzas were made, the kids toured the back kitchen of the cafeteria, which concluded with the walk-in refrigerator and freezer. Everyone agreed it was very cool. 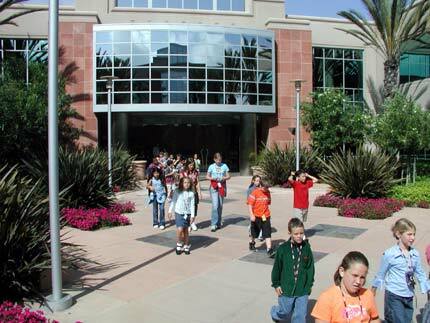 After pizza and the cafeteria, the younger crowd walked across the plaza between buildings to the next station, which was "World of Money" by Finance. Doug has doffed his sweatshirt and is now in orange. Maybe it's just me, but after making pizza, "World of Money" with the Finance Team sounds like a real let down. Wrong! Breaking up into teams of 3 and 4, they had to price goods for sale. And they were given money to go spend at other "shops." The goods for sale were items like super balls, bubbles, and false teeth that the kids could really get into buying. The team with the most money at the end won, and everybody leaves with priceless trinkets. They really got into it. Meanwhile, after the Data Center tour of computers, batteries, and back up generators, the older group made keepsake videos that were burned onto CDs for them. In keeping with the theme of the day, the interviewer asked them about "what they wanted to be when they grew up" and how they were going to achieve it. That's Brad in the center in the black hooded sweatshirt. He found another boy he knew, an older boy from his school that TA's in his room. 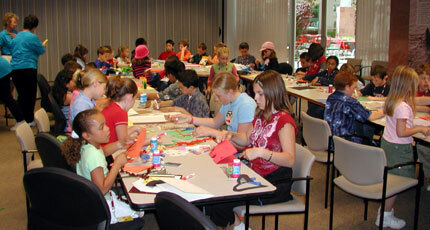 The third and final station for the younger crowd was both a craft and a service project. They made birthday cards for an Elder Care organization that Intuit's employees' charity group works with. Here you can see just how big a group this was. Doug and Sam are at the back, near the bottom of the U shaped table. The third and final station for the older kids was World of Money, the one station shared by both groups. I don't know what they sold (Brad came back with bubbles but no false teeth), but I do know they made the rules harder with cost basis of materials, rent, and taxes. Brad (far left) allowed how it was very fun, and even a tiny bit educational. Brad was very proud of his motto that the team used: "We cheat you before you can cheat us." They came in last. No word yet on whether Brad has connected the dots, but it doesn't look like marketing is in his future. 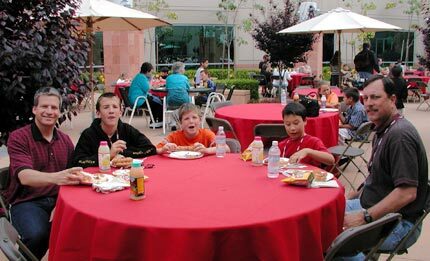 The smaller group of older kids transitions from World of Money to lunch. Lunch was guess what!? The pizzas the younger kids made earlier, along with chicken strips other side dishes. Sam and Doug check out how there pepperoni and sausage pizza faired. A group shot of the Sherwoods and the Nehers. 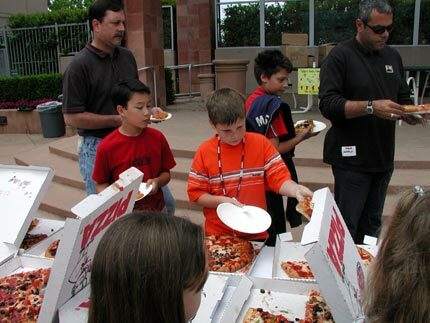 Lunch in the Courtyard was very successful: all the pizzas were eaten. No, neither of these last two (which eventually would be finished off) was Sam and Doug's pizza. 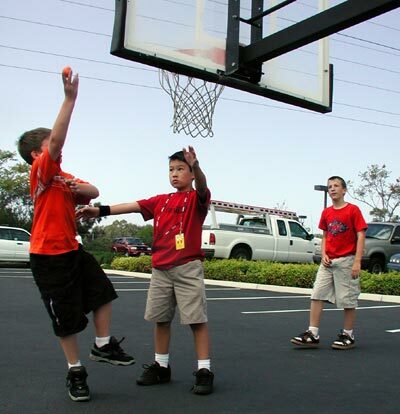 After lunch, Keith took the boys to the Intuit basketball hoop in the parking lot in a vain attempt to get their energy out before the afternoon of job shadowing their dads. They lowered the hoop really low and played with some of the toys they bought back at World of Money. Suffice it to say that the program Dad prepared for the afternoon was not nearly so interesting as morning's activities. By 3:00 when Mom arrived to pick up the boys, everyone had had enough. Who exactly she was rescuing is still open to debate.